Ginger Duck in Orange Sauce: Are you as Loved as I am? In my moments of homesickness a few weeks ago, I began to realize just how lucky I am to have the people that I do in my life. Or maybe I already realized it, hence why I miss them so much. My family has been so helpful, especially coming down to visit and talking with me on the phone on a regular basis. It has been wonderful to have them so close by. My heart belongs to Raleigh and all of the people associated with it including Jared, my two best friends, my NCSU Genetics family, and the genetic counselors at Duke. I have gotten nothing but loving messages from all of them encouraging me. How did I get so lucky? 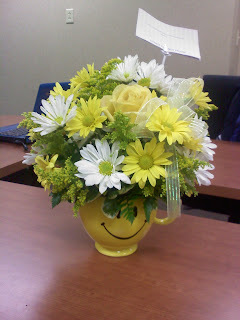 Today I received the most beautiful flowers from my former den mother at NCSU and et al. It was such a pleasant surprise, and it meant so much to me to have them not only thinking about me but also being so supportive. This is to say thank you to everyone that has been there for me over these last couple of months and those that will continue to be there. I could not do this without you and I promise to try my best to make you proud. Supportive. You know, go team.